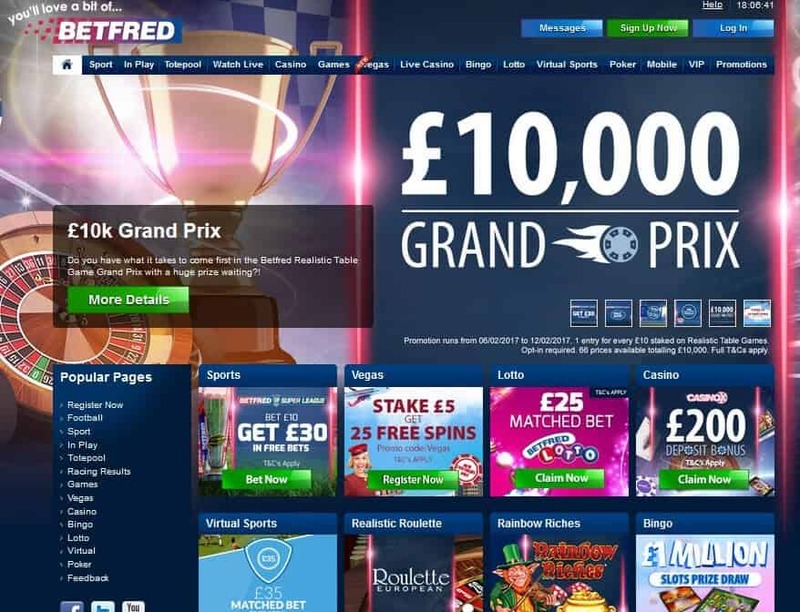 Founded more than 50 years ago, Betfred has grown into one of the top betting brands in the UK, with as varied a sportsbook as there is anywhere on the web. Aiming to be more friendly and fun than the other leading betting companies, Betfred has taken a particular interest in horse racing, as well as some more minor sports such as snooker. The independent feel to this bookmaker is very appealing to a lot of people. Their live in-play service is excellent, while their bonuses on events are very strong as well. In terms of value for money for customers through odds, Betfred is definitely one of the best online sites around, with football a strong focus, although golf betting and horse races are also covered very well. At big events such as the Grand National or Cheltenham Festival, Betfred runs special offers so plenty of free bets are up for grabs with promotion codes, as well as new deals regularly on the Premier League, for instance games involving Leicester. This BettingTop10 review will look into everything you need to know before deciding whether or not to join, so read on for the full lowdown. This firm is able to regularly offer some of the best odds available on the vast majority of sports, within the UK market. This independent-feeling and “for the people” attitude makes Betfred a standout option for this series of reviews. While the mobile betting options aren’t bad, there could be a lot of improvements. Loading speed appears to be the app’s biggest problem, with some reports of difficulties while betting. Totepools, too, are a good and niche idea for the firm, but we predict that many customers will be confused by the concept – and could end up losing money unnecessarily. Perhaps the one thing letting down Betfred is that its mobile site is not really up to scratch when a comparison with the biggest betting bookmakers is made. There is nothing massively wrong with it, but using the Betfred mobile site is not as smooth an experience as with many of the other top betting sites. A new upgrade would really help to take Betfred on to the next level and compete with the top brands in the industry. Loading speed is one of the main areas where work could still be done on the mobile site and functionality could be tweaked to make it more user-friendly as well. The mobile app is available and to download even has a dedicated Goals Galore app to tie in with one of the bookie’s best-known promotions. The process to login at Betfred is quick and easy to navigate. If you don’t have an account, click the “Sign Up Here” button to register. It only takes a minute to enter your details on the Betfred login page and you can get free bets and free spins as a bonus after your first sports bet has been settled. Once registered, click the “Log in” button at the top right-hand corner of the website. A box will appear in the middle of your screen. Carefully enter your username and password. If you do this correctly you will be directed to Betfred’s main betting page. If you receive a message saying “incorrect username/password”, you will need to start the process again. Be careful not to do this too many times or your account will be locked. If you can’t remember your username or password, click the “Forgotten Login Details” button. Enter your email address, date of birth and answer a security question to receive an email containing a link that will get you back into your account. If you can’t find the email, have a look in your spam folder as it may end up there. Click the link provided. This will take you to a secure web page that will give you the option to reset your password on the Betfred login page. If this meets their requirements, you should be able to access the homepage with your new login details. If you do block your account, contact customer support via live chat, phone or email and they will be happy to help you get back up and running. Deposits made into accounts go through a reliable high quality encryption system, so customers can always be assured that their money is going to be kept safe and sound. All of the usual major credit and debit cards are present in the list of deposit options, although they are subject to a minimum deposit of £5, which is in line with most of the other main online bookmakers in the UK. PayPal, Skrill, and Neteller are available too for those who prefer to use an online payment method to top up their Betfred website funds, rather than a debit or a credit card. Withdrawals from accounts are subject to the company’s standard security checks and can take up to 48 hours to be processed. Withdrawals should also be paid back to the deposing method wherever possible, which is the same with most of the big-name UK bookies. A detailed FAQ section on the desktop website contains answers to many of the queries a customer might have about their account – just sign in to find it. There are various ways to get in touch with customer service agents working for Betfred, with 0800 028 7747 the number to call from the UK. Live chat is also available on a 24/7 basis, which is useful should you have an account problem late at night, while the [email protected] address can be used to send email questions from the full site. The customer support at Betfred can sometimes be a little no-frills, but there are no major issues here that would stop the betting website from getting a good review. Betfred has a huge sportsbook and as such, it is a very appealing draw for those who want to place bets on a wide array of sports. Odds are highly competitive and they are usually some of the best prices available from any of the best betting sites in the UK, so you can be sure you are getting great value for your money, especially if you have a promo code. While some work could be done to bring the mobile site up to the standard of some of its main competitors in the gambling industry, the Goals Galore app certainly helps to make sure it stands out from the crowd. In-play betting is another of the major strengths of Betfred, with lots of live statistics and information to help you to make the most informed decision possible when making wagers. A specialist cash out page is also available to customers so you can decide whether or not to take a profit or let your bet ride, with a calculator available to check your winnings. At BettingTop10, we love the independent feel of betting here and its friendly feel really marks it out as one of the best British bookies around.